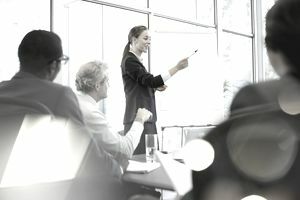 An invitation to present your ideas or your proposal to the executive management team is a great opportunity to make a positive impression on the people who have a voice in your future. If this is your first time presenting to this group, it pays to know your audience and set yourself up for success with proper planning. They appreciate well-prepared presentations: Executives appreciate discovering intelligent new voices in the business and they will be paying close attention to you. Come prepared to deliver. You’re always on the clock when you are in front of executives: While they’re interested in what you have to say, their attention spans are short. Use your allotted time carefully. Don't assume you're pitching to a team: We tend to think of them as the “executive team” however, they are better described as a collection of smart, successful functional experts who come together from time-to-time to engage on the big issues facing the business. Roughly translated, if you’re selling them on a new proposal, you will have to sell them one at a time. Executives love data-driven discussions and recommendations: They’ll descend upon your numbers outlining costs and returns like a pack of hungry wolves. However, if you bring questionable or confusing data to the meeting, it is possible you will lose an extremity. Executives are always hunting for great talent: Emphasis on “always.” Work hard to make a great impression. Carefully construct, support, and practice your message: A simple exercise for distilling your message down to its component parts is called message mapping. Here's how you do it: Draw a circle in the center of a sheet of paper. This is your core message. It should be no longer than one or two sentences. Yes, it’s difficult to distill your message down to a few brief sentences, but you must. The time invested now will pay dividends in your live presentation. Surround your core message with three or, at most, four additional circles. Fill these in with the primary data points that support your core message. This might be market research, customer feedback, competitor data, or your own projections. If needed, go just one layer deeper and attach supporting data for the supporting data. Learn to use this message map in both directions. Describe your core message and supporting points, or describe a supporting point and connect it to your core message. The map works in both directions. Practice it like a politician preparing for a debate. Ensure your message focuses on opportunity development or burden relief: Executives are interested in strengthening their ability to compete for and retain customers and reduce costs. Make certain your value proposition is tight. Do not sugarcoat risks in your presentation: On the contrary, a well-developed list of potential risks and a risk mitigation strategy show the executives that you are thinking about everything. Carefully prepare meaningful, simple visuals: Have several people—including your boss—review them for quality, clarity, and completeness. Now is not the time for animation magic. Make certain that the visuals use text sparingly and numbers carefully. Mentally divide your time allotment in half: Know how much time you have been allocated and plan to use only half of it. Bring it! Executives look for confidence, clarity, and completeness of thought when listening to the ideas and proposals from employees. Your message and your body language must support the notion that you are confident about your ideas. The harder you work, the more relaxed you will be: Practice your presentation until it is natural. Your confidence will be contagious. If you are uncomfortable presenting, fix-it in a hurry: Chances are it’s too late to seek formal training or coaching, so recruit a buddy you trust to offer critical feedback and run through the presentation with him/her. Avoid this in the future by signing up for speaking training or joining a local Toastmasters group. Leverage a subtle power move: If possible, grab a marker and get to the whiteboard. This is a presentation power-tip. By doing this, you involve and engage the audience and showcase your confidence and expertise. Passion for your topic is positive: Executives love to hear and feel the passion in your presentation. If you believe in something, make certain you use all of your faculties to communicate your commitment. Your passion for your project is impressive and contagious. No surprises please: If your request involves resources or budgets from multiple groups within the firm, the executive presentation is not the time to spring this as a surprise. Work ahead of your presentation to line-up support from your counterparts in other departments. We all know you only get one chance to make a first impression. When it comes to your first invitation to present to the executives, it pays to work overtime to prepare.